When searching for ideal Orlando Florida hotels for your Central Florida vacation, make your reservation at the Holiday Inn Orlando International Drive Resort. 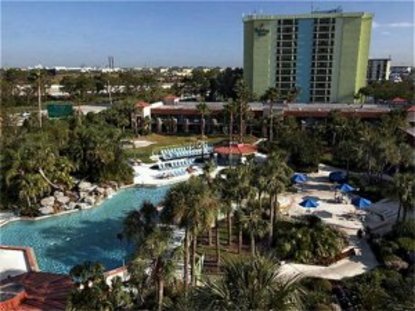 This Orlando FL hotel&regs convenient location is in the heart of International Drive, and offers guests easy access to the most popular Orlando attractions and exciting things to do in Orlando Florida. Use our Orlando Florida International Drive hotel&regs complimentary shuttle to discover adventurous thrills at Universal Orlando, marvel at an amazing underwater paradise at Sea World, and cool off with an exciting trip to Aquatica or Wet&regn Wild. Onsite, take a refreshing dip in our sparkling outdoor pool or whirlpool. Work out in our newly-renovated fitness center with all new exercise machines. For tantalizing meals, choose from several delectable dining options and enjoy a drink and pleasant conversations in our elegant cocktail lounge. And remember, kids eat free Experience event planning Florida-style, with delicious catering menus and 20,000 square feet of function space. For great Orlando vacation deals, this pet-friendly hotel offers valuable Orlando vacation packages for your family vacation or romantic getaway. Book your lodging at the Holiday Inn Orlando International Drive to take advantage of smart accommodations including free high-speed Internet, an unrivaled location, and attentive service from our courteous staff. This hotel is committed to providing accessible facilities under the American Disabilities Act. If your accessibility needs are not met, please contact the Hotel Manager on Duty. Should you require additional information regarding accessible facilities for guests with disabilities, please call 1-800-Holiday (U.S. and Canada) or contact the hotel directly. For the hearing impaired, TDD service is available at 1-800-238-5544 within the U.S. and Canada.